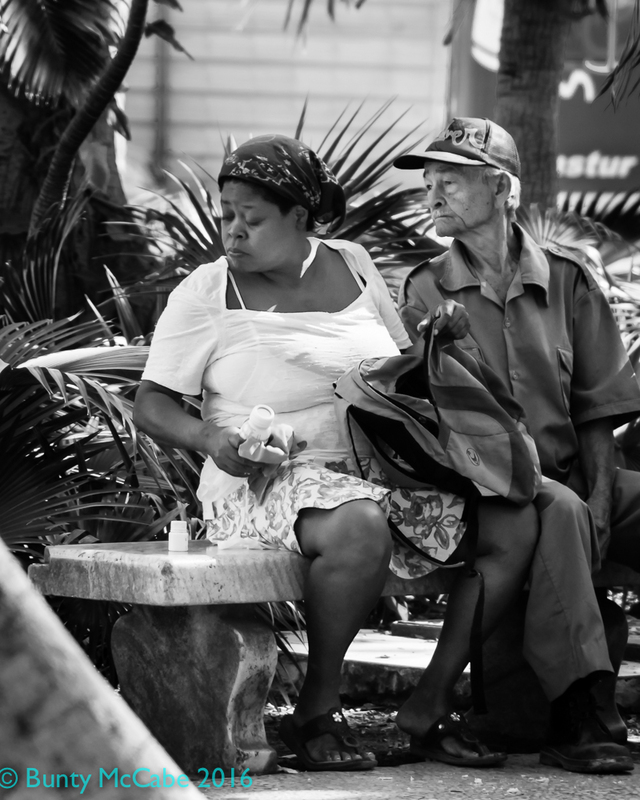 Cuban Faces in Black and White « "I do wander everywhere"
This entry was posted in Cuba, Street photography and tagged Black and white, Central Havana, Cuba, Havana, Portrait. I love these photos, Bunty. I love them. Do you ask permission? 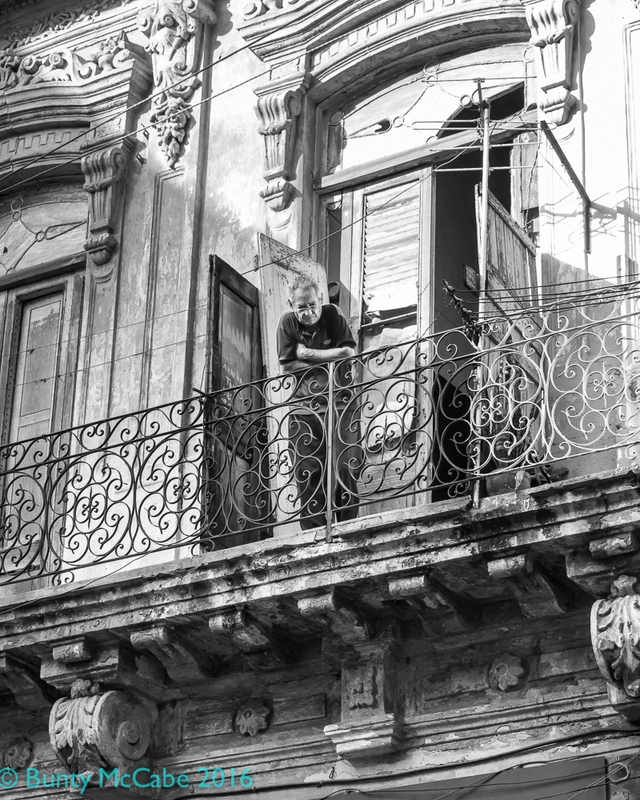 I find everybody in India wants to ‘pose’ but I am no good at all in just clicking without getting their ok.
Hi Allison: In Cuba if you point to your camera they will nod and just go about their business. A few pose – which makes for awful photos – and rarely does someone say no. My colleagues – I was on a photo workshop – were often very close to the same subjects because they had different lenses, so I’d just stand back a ways and wait for the right moment. On the other hand, the second, third and fourth of these shots were taken without the subjects noticing me. Lunch in the park is particularly lovely. I had posted a colour version the week before but taken from further away which I really like too. Thanks. Lovely photos but I can’t help but wonder what colours I’m missing out on. The whole place just looks so photogenic. Do you speak Spanish or did you learn some for this trip? 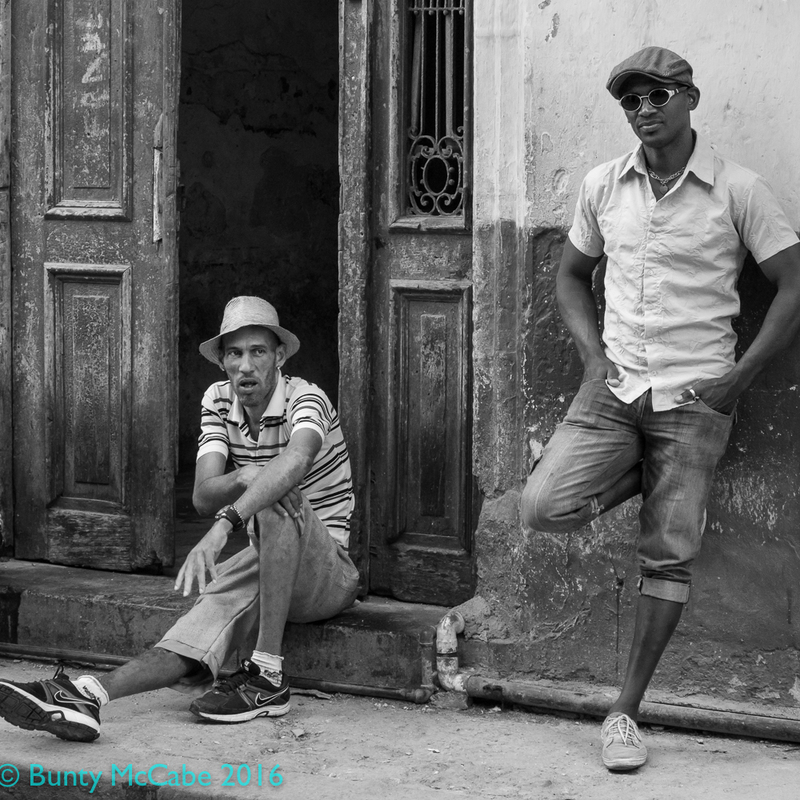 I have been posting photos from my Feb 2016 trip to Cuba on Thursdays for some time now and most of the ones I’ve posted have been in colour. The April 6 post had the same two having lunch – but in colour. Sometimes the colour is just too garish and distraction. I have only a few words in Spanish but on most days I was with our workshop leader who does speak fairly well. 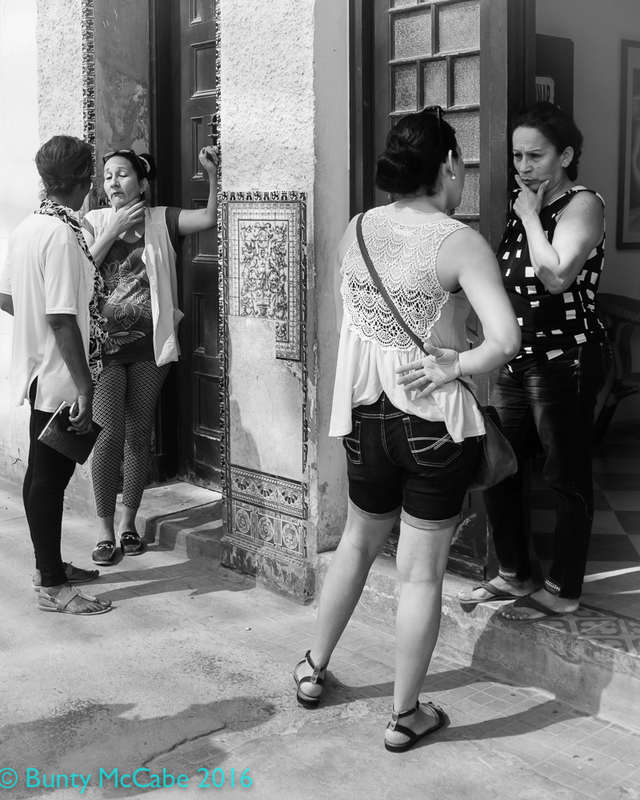 And I don’t think you need any Spanish to visit Havana and wander the streets with a camera; the locals are used to it. They’re all so fluid and tell a different story! The lady with car is my favorite. That’s a classic! Thanks for watching and commenting. 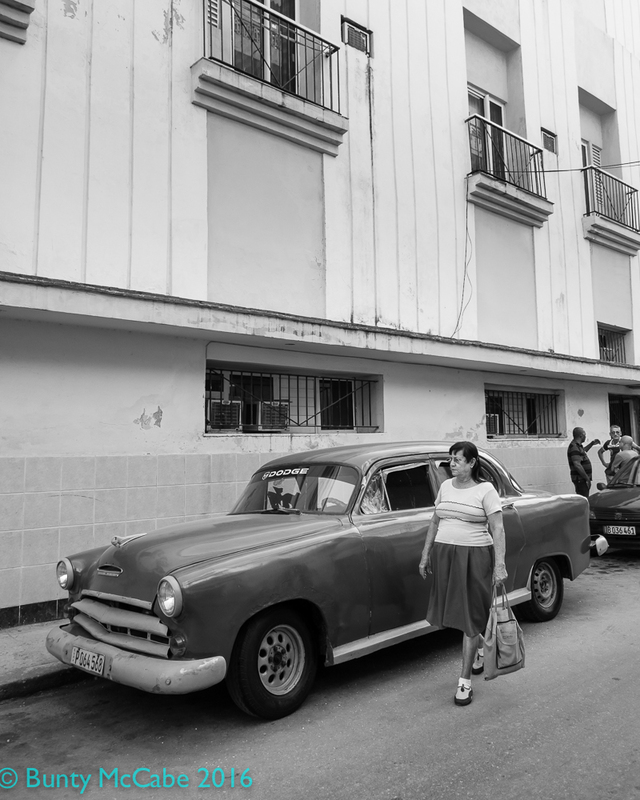 I had posted lots of cars earlier in my Cuban series but this was more about the woman and the neighbourhood. It felt like stepping back in time. Her clothes even speak to the right era as the car! Some of them dress fairly elegantly, but most people are wearing low end, low quality clothes. Thanks Julie. Off to the UK tomorrow and I haven’t even finished posting from Cuba or last year’s Canadian trip. Back to the blog when I get home. You have a great eye for street photos. They work great in black and white. It may inspire me to try more shots in B & W with my own photos. I get home, look at them in colour, and if the colour is overwhelming, or there is good contrast, or the photo just doesn’t work for me, I convert it to black and white and check that out. It’s amazing how the switch to monochrome can make a so-so picture look really good.